About a month ago I put together a story on wrestling attendance. It’s been on the rise this year at OSU so much that with solid crowds over the next few duals OSU could set one significant record. The Mat Talk Almanac started tracking wrestling attendance numbers during the 2001-2002 season. The highest aggregate attendance numbers for OSU during that period was in the 2016-2017 season. They had 40,330 attendees over eight total duals which averaged 5,041 attendees per dual including a Gallagher Iba record of 14,059. Here are the current numbers for this season. The aggregate number is not out of the question, but will be hard to reach. OSU only has four duals remaining and wrestle a total of seven this year. In that season OSU wrestled eight. 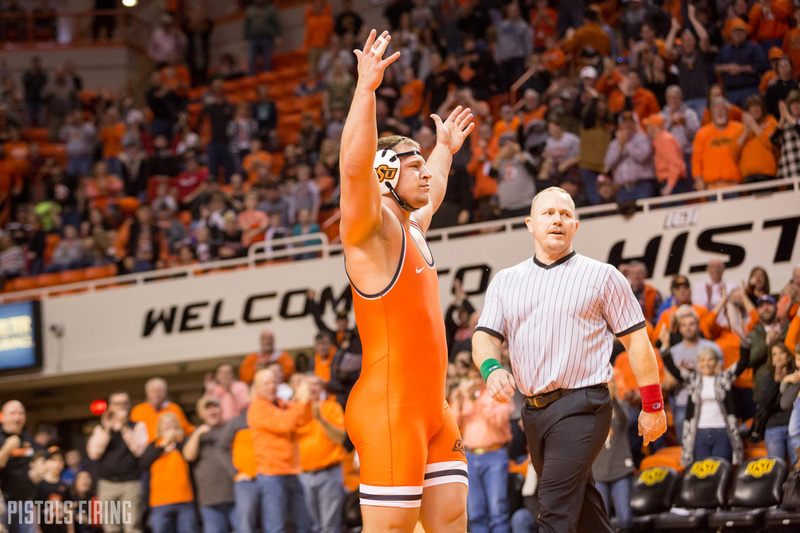 It’s fairly unlikely that OSU could match that number wrestling one less home dual. The average attendance record on the other hand is certainly feasible. OSU is only roughly 52 attendees off the pace with a huge finale vs. third-ranked Iowa to close out the season. 2/1/2019 Northern Iowa Stillwater, Okla.
2/8/2019 Air Force Stillwater, Okla. The mark OSU will need to hit to break that average record is 5082 attendees per dual for the remaining four duals. Some can have more and some less naturally, but an average of that many over the next four duals would create a season average of 5,042 and thus break the record. The final vs. Iowa will certainly be a huge draw. For OSU to break this record they’ll need at least solid crowds for Northern Iowa, Lehigh, and Air Force though. Those aren’t the marquee Bedlam- or Iowa-type matchups and Lehigh falls on Super Bowl Sunday, but fans have been showing up this year. There is definitely a real chance for OSU to break the best average attendance in the past 17 years and possibly the best in the history of the program.